Youth and peat community education through nature learning to build green generation. BP2LHK Banjarbaru (9 July 2018). Research and Development Institute for Environment and Forestry Banjarbaru (known as BP2LHK Banjarbaru) institutionalize to educate youth and peat community. It would be expected to nurture their passions to manage a peatland sustainably. With nature learning, they might be a green generation to benefit for nature and also to tackle more comprehensive in the future. They are developed to be a peat care generation through facilitate to learn throughout a peat and its management. Students, that are Elementary schools, junior high schools, and senior high schools and also community is part of human resources to manage peat well. The activities would be a program conducted by BP2LHK Banjarbaru by years. 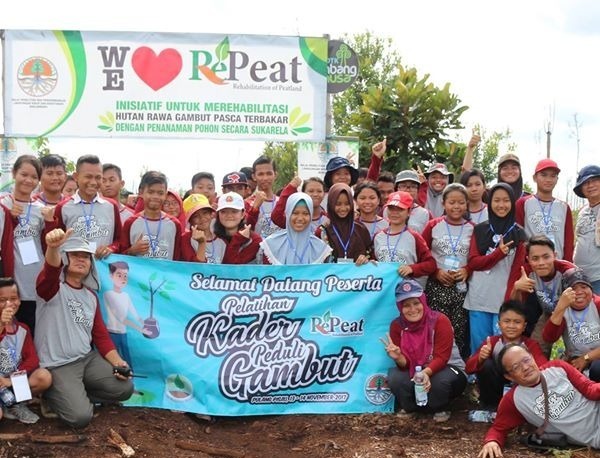 Within day to day, BP2LHK Banjarbaru is nurturing to the students how to manage peat as a part of their live in Pulang Pisau District Central Kalimantan. Shaping a peat care generation, lots activities such as learning management of peatland and its benefits, particularly how to restoring degraded peatlands, then learning about establishing peatland nursery. The main experiences would be learning by doing by planting in ex-fire area of peatland to touch, to smell, to feel the peatland is. As a senior researcher who was former of the peat care generation, Purwanto Budi Santoso described, to follow up the RePeat Generation program, in 2018, they will plan to arrange a meeting with the peat care group, developing the deliberation activities of rehabilitation. The developed activities would be nurtured while disseminating voluntary restoration degraded peat forestland, involved social media to mainstream the mission, said by Purwanto Budi Santoso.